On May 12, 1968, a C-123 Provider assigned to the 311th Air Commando Squadron and piloted by Lieutenant Colonel Joe Jackson took off from Danang Air Base in South Vietnam. The mission was to fly north toward the DMZ and back down the coast toward Chu Lai, stopping enroute to resupply several outposts. The mission went well when the crew received an unexpected message to return to home base. Meanwhile, 45 miles to the southwest of Danang, near the Laotian border, a massive airlift operation was underway at Kham Duc. A steady stream of C-123s and C-130s shuttled into the isolated Special Forces camp to evacuate 1,000 friendly troops. Out numbered, they had been under siege by communist forces for three days. Back on the ground at Danang, Colonel Jackson and his crew were briefed on the emergency rescue operation. They were airborne again in less than an hour, heading southwest toward Kham Due. As they flew inland the C-123 entered a holding pattern south of the camp. The evacuation was hectic as an airborne command post controlled the flow of cargo planes into the short airstrip that lay unprotected on the valley floor. Forward air controllers directed fighter-bombers against the Vietcong positions surrounding the runway.’ As Colonel Jackson’s aircraft moved closer to the camp, smoke and flames from exploding ammunition dumps and tracers from enemy weapons were clearly visible. The radio chatter confirmed that the last survivors had been rescued and the command post directed the fighters destroy the camp and the enemy with it. But something was wrong. An animated voice on the radio warned that three US airmen had been left behind. Attempts to contact the three combat controllers failed and the command post asked the C-123 ahead of Colonel Jackson to land and try to pick them up. As the Provider touched down it came under heavy fire and seeing no chance to locate the three airmen, the pilot jammed the throttles full forward and prepared for takeoff. Just before liftoff the crew spotted the three controllers crouching in a ditch bordering the runway but it was too late to stop. The C-123 lifted off through a volley of bullets. Low on fuel, it headed for home base. Joe Jackson had an answer for the question even before it was asked. Would he? There wasn’t any question about it. There wasn’t any decision to make. Of course he and his crew would attempt the rescue. Colonel Jackson called on his previous fighter-pilot experience and decided to try a new tactic. He knew the Vietcong gunners would expect him to follow the same flight path as the other cargo airplanes. What if he could take an elevator approach straight down into the valley? Nine thousand feet high and rapidly approaching the landing area, Colonel Jackson pointed the C-123’s nose down in a steep dive. Taken by surprise, the enemy reacted in time to open fire as the diving Provider neared the airstrip. Breaking the descent just above the tree tops he settled down on the debris-littered runway and skidded to a stop. The three combat controllers scrambled from the ditch and were pulled onboard. In the meantime a 122 millimeter rocket shell came to rest within 25 feet of the aircraft’s nose. Luck was still on their side as the deadly projectile didn’t explode. Colonel Jackson taxied around the shell and rammed the throttles to the firewall. They hadn’t been out of that spot for ten seconds when mortars began raining down. Just ahead tracers illuminated a murderous crossfire and there was no turning back. Slowly picking up speed, despite intense fire from the far end of the runway, the airplane broke ground as Kham Due fell behind them. 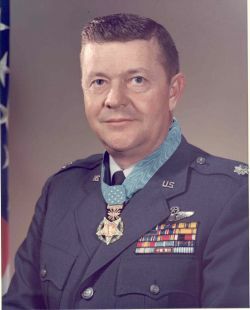 For conspicuous gallantry and his profound concern for his fellowmen, Lieutenant Colonel Jackson received the Congressional Medal of Honor from President Lyndon Johnson on January 16, 1969. Lieutenant Colonel Jackson was the Airlift/Tanker Association’s “Hall of Fame” inductee for 1997. Joe Jackson is a great hero and deserves all honors afforded him- I was there on May 12,1968. The command group at 834 Air Force should have been court martialed for sending the CCT back to kham duc.